Is ITIL 4 just for ITSM professionals and big corporations? How can the new ITIL certification path help you take your career to the next level? We look at the many uses of an ITIL certification. Contact Good e-Learning today to find out more! Who can Benefit from ITIL 4? IT is an undoubtedly holistic asset; one that permeates everything we do in both business and daily life. IT-enabled services are the lifeblood of modern organizations, with most customers now expecting many features as standard. At the same time, internal ‘services’ ensure that organizations can run smoothly and efficiently, essentially forming the foundation on which change management and optimization are built. All of this has turned IT service management (ITSM) into an essential practice, both for sustaining day-to-day operations and supporting larger business goals. Rather than simply relying on experience, however, many IT managers will opt to follow established and well-practiced ITSM frameworks, with the most popular being ITIL. Formerly known as the ‘Information Technology Infrastructure Library’, ITIL is used all over the world by every industry from oil to animation. It is a non-prescriptive management framework which provides tools and guidance on maximizing all IT-enabled services, whether they are designed to improve customer experiences or simply to keep an organization running smoothly. That is not to say that everyone in IT has heard of ITIL. Indeed, many people may be unclear about who exactly can benefit from using the framework. With the updated ITIL 4 set for release across 2019, let’s take a look at who the framework is designed to help. Looking at IT from a strategic business point of view, it is easy to see the allure of ITIL certifications. The framework can be adapted to meet the needs of virtually any organization which utilizes IT, creating an atmosphere of continuous improvement and innovation. Not only can this help to maximize the value of IT-empowered services, but it can also leave an organization far-better-able to adapt when new opportunities, challenges or customer expectations appear. With ITIL incorporated into the heart of your business’ decision-making process, you will soon start to enjoy major advantages across the board. While the ITIL framework is ideal for managers with technical backgrounds, it can also be helpful for those with a focus on business. Effective change management requires managers to take technological considerations into account, and ITIL can offer the perspective to help managers realize this in practice. An ITSM practitioner who is familiar with ITIL is the ideal employee for planning and implementing major projects, as well as solving urgent technical issues and providing a technical perspective for key business decisions. However, it would be inaccurate to say that an ITIL certification alone can help someone build a career in ITSM. According to PayScale, the average salary for someone with an ITIL Foundation certification is $93K. It is only with enough experience, as well as examples to show their ability to apply the framework in practice, that practitioners will be able to reach this salary and beyond. Having said that, ITIL is undoubtedly a valuable career stepping stone. For one, it can create a variety of opportunities for work at organizations which employ the framework (which are in no short supply). It can also validate the abilities of a more experienced ITSM practitioner, helping them to advance to higher positions. Each branch also features the ‘ITIL Strategist - Direct, Plan & Improve’ module, though this only needs to be passed once. With the variety of modules on offer, an ITSM student can tailor their studies to suit their immediate requirements. An added bonus for this is that by focusing on the most relevant modules, a student will usually find it far easier to justify training expenditures to employers. ITIL has been a widely used tool in enabling IT-led and cost-effective business transformations since 1989, and there is no shortage of case studies to demonstrate its effectiveness. The idea behind the framework is that it can create an atmosphere perfect for continuous change and improvement, constantly delivering greater business value. A change/ transformation consultant with an ITIL certification will have a skill set ideal for businesses looking to transform their IT operations. The framework is also designed to be compatible with other popular frameworks, including Agile, DevOps and Lean, making it far easier to sell to organizations which already utilize ITSM certifications. Corporate certifications can be an excellent indicator of a candidate’s skills, experience and ambition. Certain hiring managers may even specifically look for candidates with ITIL certifications, especially if they belong to an organization which is already using, or planning to use, the framework. If you have already gained a certification in ITIL V3, you may be unsure about whether or not it will be worth bringing it in line with the updated framework. While AXELOS has specified that V3 certifications will remain valid, it has also stated that V3 books will no longer be published after June 2020. That being said, there is no doubt that the modules covered in V3 are still highly relevant for ITSM, so why make the effort to bridge the gap to ITIL 4? 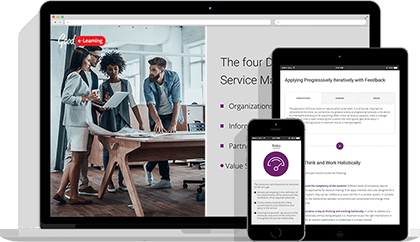 One of the reasons is that ITIL 4 represents a huge update to the world of ITSM. It offers a great deal of new guidance and examinable content, much of which revolves around marrying the framework with popular alternatives such as Agile, DevOps and Lean. Perhaps most importantly of all, the ITIL practitioner community played a key role in the development of ITIL 4, ensuring that it could accommodate modern ITSM practices and opportunities. This community will also remain on hand to develop it further, as well as provide support for users. Another reason is that making the transition to ITIL 4 is much less complicated than you might think. Those who have achieved the ‘ITIL Expert’ level will simply be able to take the ‘Managing Professional (MP) Transition’ module to update their certifications. Indeed, those currently studying ITIL V3 are even being encouraged to keep going until they reach this point, though those who have only reached Foundation level are advised to start again from the beginning. Why Gain an ITIL Certification with Good e-Learning? Good e-Learning is one of the world’s leading providers for online corporate training. We are a seasoned e-course provider for ITIL V3, and this year we became one of the first elearning companies to offer an accredited online course in ITIL 4 Foundation. We understand the difficulties of juggling corporate training with full-time work. We tackle this in two ways. Firstly, we make sure that each of our courses is accessible even on mobile and tablet devices, making it easy for students to return to their studies whenever they can find the time. Secondly, we provide months of course access, giving students ample time to fit studying around their daily commitments. Unlike the competition, we do much more than simply provide students with slideshows and documents. Each of our courses also contains a variety of engaging learning tools, such as interactive videos, audio-tutors, motion graphics and even gamified quizzes. Students can also enjoy 24/7 tutor support, with our in-house experts typically responding to course queries within 24 hours. Want to find out more about our approach? Visit our free resource library, or contact Good e-Learning today!